Strategic-reports.com offers 11 marketing and advertising services with strategic planning, written processes and integrated campaign optimization. Pardon us - but we don't just churn out marketing deliverables without a business strategy front-end and a creative brief to check that your business and IT strategy align with your marketing automation systems. We think it's a waste of your money and our time. Like your car, your business needs to have all systems run together for the common goal of safe and direct navigation to where you want to go. For marketing deliverables, a creative brief is the best way to avoid problems down the road. 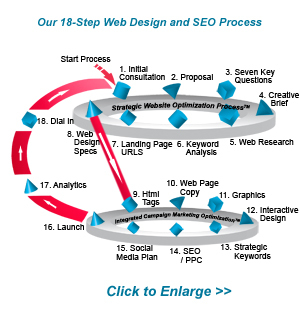 Go Slow to Go Fast - We've developed an 18-step process, shown in the figure below, which might take a little more time up-front, but can vastly increase your project ROI. Like in sailing and many other endeavors, having a winning strategy will always result in the "fastest time to the mark". systems all fit seamlessly together. In this way we can best support your customer acquisition and retention processes and of course, your sales and profits. Helping you perfect a system to intelligently engage and retain new and profitable customers is not only our vision, but also our commitment to you.